I doubt that the FBI will recover much of it's dignity to my generation. They sold us out in the worst possible way to the worst possible politicians. Had Hillary won, we would have never known for sure, but (thank God), she did not win. In time the current scandal involving Director Comey will fade as the Ruby Ridge cover up did. Ever defensive of its reputation, the FBI is saying, "nothing to see here, move on." The FBI said that right after Deputy Director Robert Hanssen (who spied for the Russians for 22 years) was convicted...nothing to see here, move along. I recall that. You may or may not. The FBI corruption during the Obama years has been legendary. The Uranium One scandal and the failure of the FBI to properly investigate the corruption surrounding the sale of uranium to the Russians is epic. Can they ever be trusted as an agency? That's a good question, isn't it? We expect this conduct in the Third World. It's the rule rather than the exception there, but it's always been one of those things we hoped would not happen here in the USA. The years of Obamanation were difficult years. But the bees are in the buttermilk now. 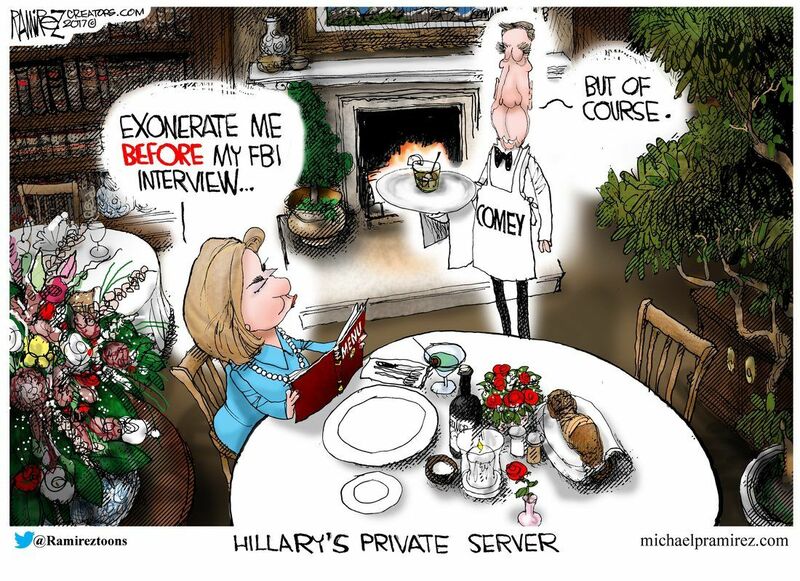 The only thing that can save the FBI now is the corrupt, elite, smug, nasty, lying mainstream media? Maybe we should swear everyone at NBC and CNN in as FBI Special Agents? Yesterday, 23 October, the Philippines announced the end of five months of military operations in Marawi City. Offensive combat operations were terminated after troops overcame the last stand by the remaining Islamic State-affiliated gunmen who had captured Marawi City. Artillery and automatic gunfire were still heard on the 23d. The bodies of 40 Muslim fighters and two of their wives were found near a mosque and in two buildings close by. Defense Secretary Lorenzana said six battalions of troops would remain to deal with stragglers. He thanked the United States, Australia, Singapore and China for providing weaponry and technical support, including surveillance aircraft. Philippine authorities said 920 militants, 165 troops and police and at least 45 civilians were killed in the conflict, which displaced more than 300,000 people. President Duterte declared Marawi City liberated six days ago, but, at that time, Philippine military sources said about 40 Muslim fighters remained holed up in some buildings. The Philippine forces took their time in liberating Marawi City. Their tactics helped ensure that no survivors remained to spread Islamic terror. We continue to judge that the Philippine government also wanted to make the fight for Marawi City an object lesson about the fate of terrorists and their supporters. Over the weekend, South Korean leaders announced that they had the means to take out North Korea’s leadership and its nuclear weapons. South Korea outlined its three tiered-plan to neutralize all North Korean long-range artillery and its short range ballistic missile installations. South Korea seldom threatens North Korea with provocative statements. North Korean propaganda has focused primarily on the US to try to neutralize the US threat by holding American cities and territory hostage to long range ballistic missiles. The international press seldom pays attention to the military capabilities of the Republic of Korea. The ROK armed forces are close at hand, well-trained and well-equipped. They would be the forces that defeat North Korean forces north of the Demilitarized Zone and move against Pyongyang. North Korean propaganda deliberately refuses to cover the threat from South Korea or, at most, minimizes it as an adjunct of the US threat. However, the North Korean vice marshals and generals are keenly aware of it. Since the mid-1990s, North Korean winter training has concentrated on defeating a South Korean attack northward, before North Korea could mount an offensive against the South. Turkey and the US. The Syrian Information Minister Mohammad Ramez Tourjman said in an interview with Ria Novosti that Syria considers the US and Turkish military presence in Syria to constitute aggression. The Turks would like the US to leave so that they can begin the Turkish national pastime of killing Kurds. The Syrian position on the presence of foreign forces in Syria has not changed. Russia permitted Turkey to take responsibility for the Idlib de-escalation zone, no Syrian official public statement endorsed the Russian decision. The point of Syrian repetition of its position is to ensure that Turkish and US forces depart Syria and do not create a permanent presence. As for the US, al-Tanf is the location where US soldiers and US-backed Syrian proxies set up a blocking position on the land route that links Lebanon with Iran, via Iraq. Minister Tourjman said nothing about the US military presence at Raqqa or in the north. An important question is what will the US forces in Syria do now that Islamic State is defeated. Many commentators agree with the President of France that the Islamic State is not defeated, it has adapted to a new set of conditions. Thus, the fighting will continue. President Macron’s argument provides a justification for never leaving Syria. He suggested that the struggle to oust President Assad could resume, now that Raqqa had been liberated. He cited the need for a transitional government to be formed. The Syrian and French statements are reminders of the many divisive issues that remain unresolved. For some key actors, the Syrian civil war has not ended. It has entered a new phase. Macron’s comments might hearten the Syrian opposition, but Russia will reason with the French because it is looking for an opportunity to draw down its forces and hand-off the financial burdens of Syrian reconstruction. Is it made from real wolves? Are girl scout cookies made from real girl scouts? You may have your answer. 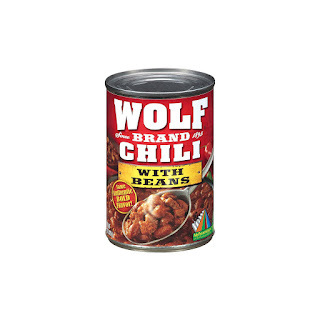 I have never eaten wolf chili, but I'm sure that it's good since our fellow blogger, Juliette, recommended it. After having kicked some rocks, tossed the runes and flicked some beads on the abacus, I think that I have a better grip on Phase 2 development at the White Wolf Mine. It will include a barn, solar panels, a green house and a well/pump room, and it will be on the Southern Property rather than there with the hovel. Once complete, I'll begin contemplating Phase 3. No, excavation has not begun yet (wince), but you can see the stakes in the ground for the footings and for some digging that needs to take place (in the photos below). Things have been going slower than anticipated because, as was pointed out to me, elk season is still underway. I saw two white tail deer on the property. A buck and a doe made an appearance. Arizona white tail deer are a subspecies, the Coues deer. I've seen mule deer up on the property, but the Coues deer are about half the size of a respectable mule deer. Larger than a German Shepherd, but not that much larger. Elk season has driven some big horn sheep into the area. A neighbor complained that there were two dozen on his property last week. Big horn sheep are just one more wild species that is common to the Mogollon Rim area in the Arizona highlands. The weather was spectacular with highs in the 70's. The night was chilly, but not cold. Looking east toward the far ridge line. Winter has come to the White Wolf Mine and the only thing that is green are the ponderosas, pinions and junipers. The leaves are off the oaks and the elk are scarfing up the acorns. You will note that we have stakes in the ground to guide the excavation but also that it hasn't begun yet. I really want to get that complete and have the foundation formed for concrete (which means electrical, water and plumbing lines in place) before the snow hits. Patience is called for on my part, but not eternal patience. I'd like to move into the house in mid-2018 and time will tell (and the weather will tell) whether that's going to happen.